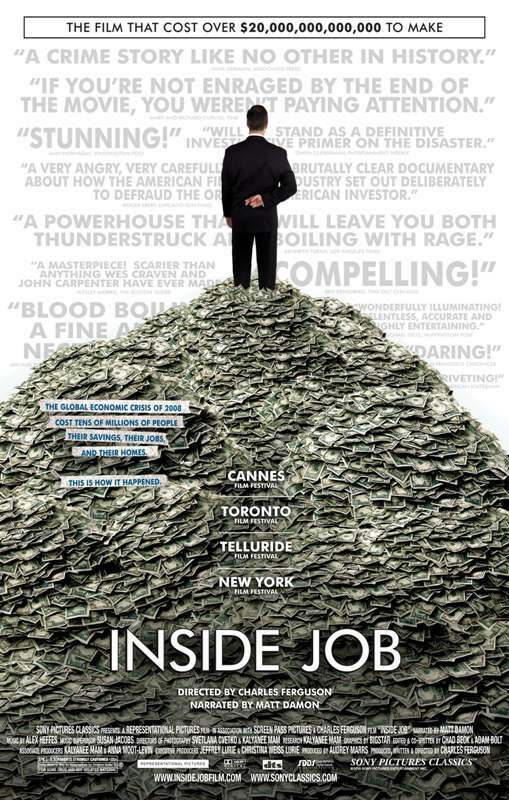 Just a few months ago, we did a post about Charles Ferguson's newest documentary INSIDE JOB, a timely and important documentary contextualizing the recent economic crisis. Named the top film of 2010 by The New York Times movie Critic A.O. Scott, we will highlighting this insightful film on this blog a few times. First with a Q & A with the movie's producer, Audrey Marrs. If you have not seen it, please do. Audrey Marrs is the producer of "Inside Job," a documentary about the global financial crisis and "No End In Sight," a documentary about U.S. policy in Iraq, for which she was nominated for an Academy Award along with director Charles Ferguson. Marrs obtained her master's degree in curatorial practice from California College of the Arts in San Francisco. After completing her graduate degree, she worked as a freelance curator prior to becoming a film producer. Marrs is the C.O.O. of Representational Pictures and resides in New York City. How did you become involved in the making of "Inside Job?" I was one of the producers of "No End In Sight," Charles Ferguson's previous, and our first ever, film. After it was released in 2007, he and I wanted to make another film together. We spent several months exploring quite a few different ideas. At the same time, Charles had been receiving early warnings about the impending economic collapse from two friends of his, Nouriel Roubini and Charles Morris, both of whom are interviewed in the film and widely credited with predicting the crisis. Charles brought up the idea of the film to me in the summer of 2008, and then when Lehman Brothers collapsed a few months later we decided we had to make it. How did you get into producing in general? I was hired as Charles Ferguson's assistant in 2003. Although I really liked my job, it wasn't my lifelong dream to be an assistant, so I decided to go to grad school at the same time and got into the curatorial practice program at CCA in San Francisco. Shortly after I started the program we began making "No End In Sight." Both Charles and I were so inexperienced that we didn't realize the function I was performing was that of a producer. One day six months prior to my thesis deadline, we had a phone conversation during which we figured this out. Although I loved certain aspects of being a curator, I realized that film was what I really wanted to do. My whole future perspective flipped within 24-48 hours. It was really really hard to finish my thesis after that. What is your background in general? It's somewhat unconventional. In my '20s I went to the Evergreen State College where I was on the six-or-so-year-plan studying art. I also played in a couple bands and was involved in the Olympia punk scene. In 2000, I planned to move from Olympia to the Bay Area with the objective of figuring out what I was going to do with my life. A month before the move I received an email from my friend Molly Neuman in which she asked me if I wanted to play keyboards in Bratmobile. I knew I couldn't say no. One of the greatest bands in the universe had asked me to play and go on tour with them so I would have to put off my plans a little longer. I'm so glad I did. I played with them for the next couple of years while working really horrible temp jobs (e.g. filing of dental records for eight hours a day). After that I became employed with Charles as his assistant and eventually his producer. I moved to New York about a year ago and am really happy to be here.